On Monday, the last day of the sale, customers could pay $4 for all the books they could fit in a bag. The annual Hyde Park Used Book Sale brought a community of booklovers to the Hyde Park Shopping Center last weekend for dirt-cheap finds from literary non-fiction to romance. This year marked its 10th anniversary under the management of the Hyde Park–Kenwood Community Conference (HPKCC), which took over the project in 2007 after the Hyde Park Co-Op (a supermarket) went out of business. Having begun as a community fundraiser for a refugee camp in South Korea during the Korean War, the book sale goes back 62 years. Today, the money raised goes to needs closer to home. Jane Ciacci, who worked in Regenstein Library for 35 years and retired from her position as director of library human resources this March, co-chairs the book sale with George Davis (S.B. ’66). The pair has been in charge of the sale for the past 10 years. “We have 1,000 banana boxes full,” Ciacci said, estimating that almost 50,000 books would be on sale this year. 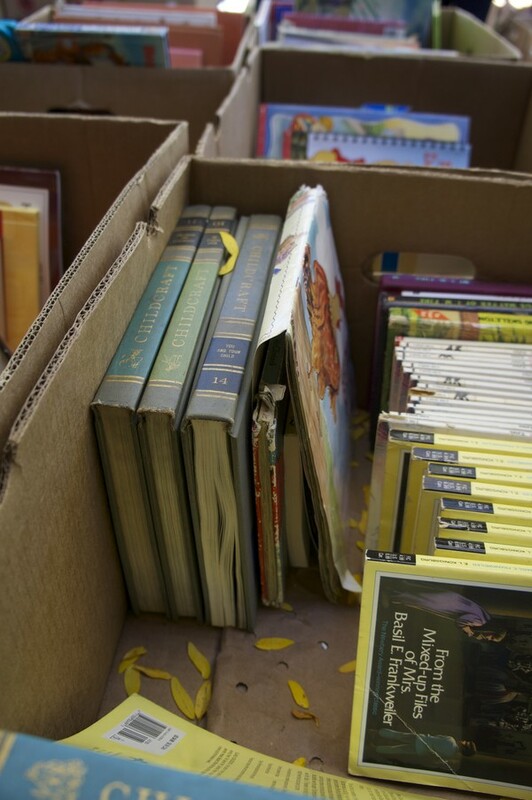 The boxes are provided by Treasure Island, which—apart from being the go-to supermarket for many UChicago students—is where books are donated and sorted. Almost 50,000 books were collected. The books they receive differ every year, although mysteries and fiction tend to consistently be the largest categories. Some of the other categories present at the sale include poetry, foreign languages, and child care. There was also a section dedicated to “special” books, which are usually priced higher. This year, a large hardback edition of The Complete Cartoons of the New Yorker was on sale for $5, while a stack of original copies of the music magazine The Etude from the 1930s–50s was being sold for $30. The prices of all the other texts at the sale ranged from 10 cents (National Geographic) to $2 (hardcovers). Large paperbacks were sold for $1 each, while small paperbacks, children’s paperbacks, and audio-visual materials (VCRs, records, etc.) sold for 50 cents. On Monday, the last day of the sale, customers could pay $4 for all the books they could fit in a bag. “We keep our prices low so that people can afford to indulge themselves, and perhaps even start a library of their own,” Ciacci said. According to Ciacci, book dealers who attend the sale generally say that it is one of the best around. She credits this to their collection being in Hyde Park, though the book sale attracts people of all backgrounds and ages, both as donors and buyers. The sale attracts professional and amateur book collectors alike. Ultimately, the book sale is about, and entirely for, the community. The money it raises goes to fund community projects, parks, and local schools. Non-profits that registered with HPKCC in advance could also pick up books for free during the last two hours of the sale on Monday before the remaining books are either sold, recycled (based on their condition), or given out to local churches, schools, hospitals, and other similar community organizations. 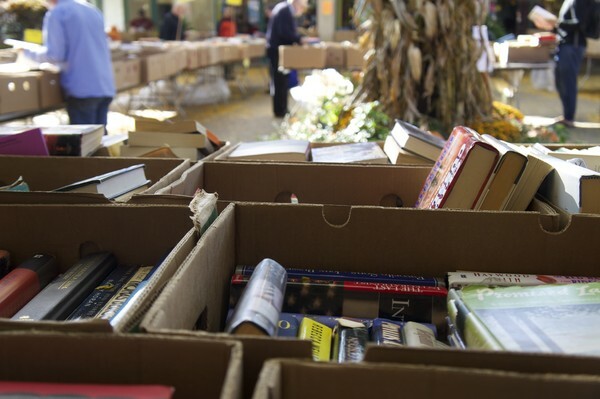 As a community effort, the book sale also depends on the support of nearby organizations like Treasure Island and the help of many volunteers in order to take place every Columbus Day weekend. While e-books and the like are growing in popularity and book-shopping has largely become a speedy online operation done through outlets such as Amazon, used book sales still retain their charm. Another committee of HPKCC, Friends of Blackstone Library, held its first used book sale last spring and is already planning another one for 2017. 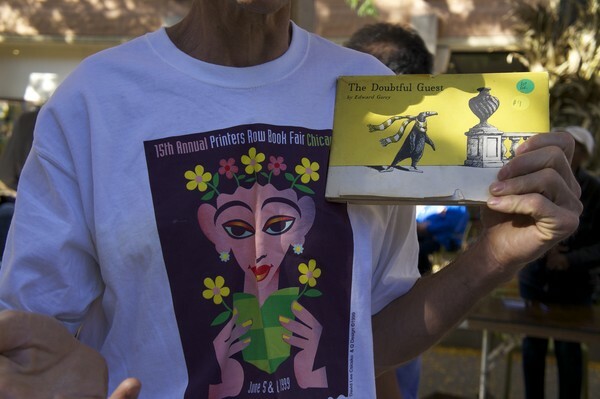 The Hyde Park Used Book Sale continues to delight and surprise decades after its inception. For whether you find a novel with annotations inked into its margins, an original edition of your favorite vintage classic, or an almost-falling-apart collection of old maps, the books stacked inside the cardboard boxes are testaments to the beauty of finding the new in the used and continuing the magic of reading in print for generations of readers to come. Books range from mysteries to math text books.